this weekend was GREAT!!! it was full of amazing friends, music and great food. friday night, i went to a pampered chef party. i felt like a real grown-up. saturday, the kc chorale sang a concert that nearly broke my back. and my voice. saturday night, the hub and i went to the opera. we left at intermission because i have musical ADHD. and i am very judgmental and unhappy about tenors. we grabbed dinner and went home exhausted. sunday, got up super early and started brunch before heading to church. 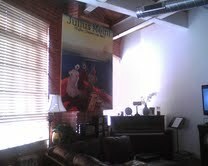 had our amazing friends over for brunch, and they hung our beautiful, huge “julius meinl” picture. see photo below. then we went and picked up a corner cabinet we bought at a garage sale and treated our truck owner and driver to a beer at grunauer. it’s amazing having an austrian restaurant just down the street from our loft. then we went to our amazing friends house for bison burgers, which were so incredible! and the best pound cake i’ve ever had. EVER!! thanks lindsey!!! that’s a lot of playing around. gotta get back to work this morning!!! feels so great to have a real weekend, though. sure, a performance here and there, but we still played a lot. i’m really excited that may is almost here!!!! which means this year is almost over!! woooooo hooooo!!!!! Next Next post: restore, renew, renovate, relax.